In the fight against a notoriously tough disease, immunotherapy is gaining ground as a treatment for advanced non-small cell lung cancer, alone and in combinations with chemotherapy and targeted drugs. Four immunotherapy drugs known as checkpoint inhibitors are now approved for use in lung cancer. Pembrolizumab (Keytruda), nivolumab (Opdivo), and atezolizumab (TECENTRIQ) are approved for patients with lung cancer that has metastasized beyond the lung to other organs. Pembrolizumab is also approved for use in combination with chemotherapy as a first-line treatment for metastatic non-small cell lung cancer. Most recently, durvalumab (IMFINZI) was approved, in February 2018, for patients with stage III non-small cell lung cancer that is inoperable, but has also not become worse following chemotherapy and radiation. The goal for these patients is to keep the cancer from progressing as long as possible. Bruce Johnson, MD, says there has been a “dramatic transformation” in the last 15 years of lung cancer treatment. Encouraging studies were presented at the American Society of Clinical Oncology (ASCO) annual meeting in June, which brings together more than 40 thousand oncology professionals from around the world to discuss state-of-the-art treatment modalities and new therapies. One large clinical trial report showed that pembrolizumab was more effective than chemotherapy as an initial treatment for many patients with the most common type of lung cancer—advanced non-squamous, non-small cell lung cancer. Compared with patients who received only chemotherapy, those who received pembrolizumab had a median survival time that was four to eight months longer. The survival advantage was greatest in those patients who cancer cells had high levels of PD-L1, the checkpoint protein that pembrolizumab targets to unleash the immune system against the tumor; all of the patients with detectable PD-L1 levels did better with the immunotherapy drug than chemotherapy. 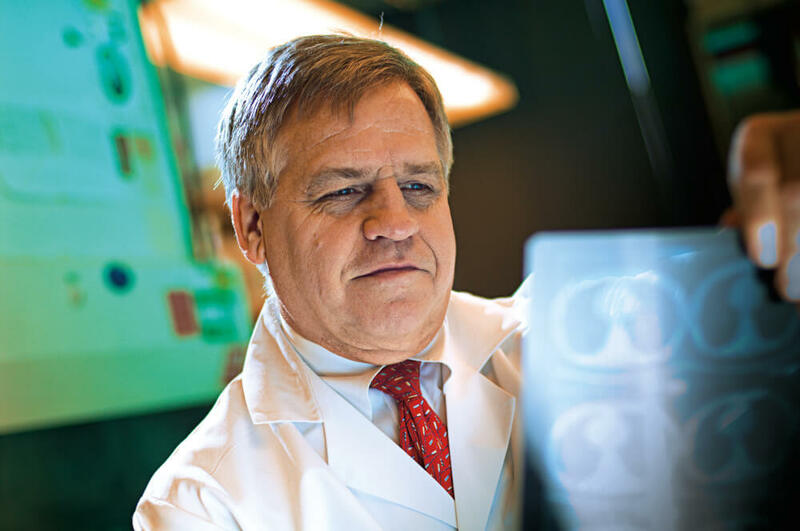 “I for one am becoming optimistic that a subset of our patients with lung cancer may actually be cured with checkpoint inhibitor therapy, a finding that is now transforming the treatment of lung cancers,” Bruce Johnson, MD, said in his Presidential address at the ASCO conference. He is a thoracic oncologist and chief clinical research officer at Dana-Farber Cancer Institute. Johnson cited a follow-up study of patients with non-small cell lung cancer who were treated with the checkpoint inhibitor nivolumab and had also been previously treated with chemotherapy. That is an important caveat: As promising as immunotherapy has proven thus far, only a minority of patients respond to checkpoint inhibitor drugs, and although some of the responses are long-lasting, the cancer often progresses again. Efforts to improve the response rates with immunotherapy in lung cancer are underway. Approaches include combining other drugs active on the immune system; adding checkpoint inhibitor drugs to chemotherapy regimens, including targeted agents such as VEGF-targeted antibodies, and combining checkpoint inhibitors with radiation. These treatments are all being studied in clinical trials. Another strategy is to identify biomarkers, such as the abundance of PD-L1 on cancer cells or the number of cancer-related mutations in the tumor, that can predict the likelihood that immunotherapy will be effective. However, to date, there are not yet biomarkers that are totally predictive of which patients will respond to immunotherapy and how well the treatment will work. Learn more about treatment for lung cancer from Dana-Farber Cancer Institute.